The Quiet War is Space Opera that hits close to home and is surprisingly digestible with its pacing. I find many Space Opera's a bit overdone, but that is not the case here. In fact this is the first must-read Sci-fi book of the year. 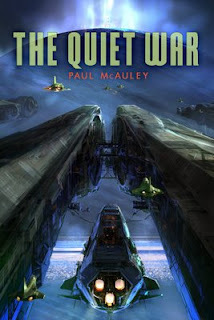 The Quiet War having already been nominated for the Arthur C. Clarke Award is quite deserving. Earth and the outer separatist colonies have been at odds for the past 200 odd years. Earth is recovering from a planetary wide environmental collapse, which seems all too feasible presently. A Green fervor has taken hold of the people and the politics as they have repairing the planet, which leaves all of the power to the most wealthy families. The colonies exists as an egalitarian societies loosely connected, where debates run rampant and action is slow. However, the people of Earth and the colonies are diverting on more than just politics. The colonies are situated on moons around planets in our solar system where they have been changing themselves genetically for generations to adapt to these new environments and also lengthening their life spans to hundreds of years. Many now consider them a separate species and as the gap widens so does the trust each group has for the other. Earth's own attempts at toying with humanity's capabilities are quite startling, especially the creation of the people on the moon, which I wish were used a tad more. The Quiet War shows that no matter what side you are on, throwing yourself too much in any direction can take you further away from your goal as so much scheming is going on you never know when a favor will be called in. Nearly every character is a pawn in a greater game of chess. Just when you think you've reached the Queen a new piece swoops in to take position. Told from multiple points of view at a multitude of locales The Quiet War brings heaps of action and suspense. The characters are sometimes stuffy, but never uninteresting. The science is spot on and believable. This is my first exposure to McAuley's work, but he has definitely piqued my interest with his highly informed style and voice. The Quiet War is the best Space Opera I have read in years. I give The Quiet War 9.25 out of 10 Hats. I didn't find out until I finished, but there is a a sequel, Gardens of the Sun, scheduled for release in October in the UK. No US publication date has been announced but McAuley has said Pyr will be the publisher so don't be surprised if you see it on their Spring/Summer 2010 list. That said The Quiet War does stand on its own but I for one would like to see what the future holds for some of these characters. Glad you enjoyed it. Sequel out in March 2010. Sparth is working on the cover now.